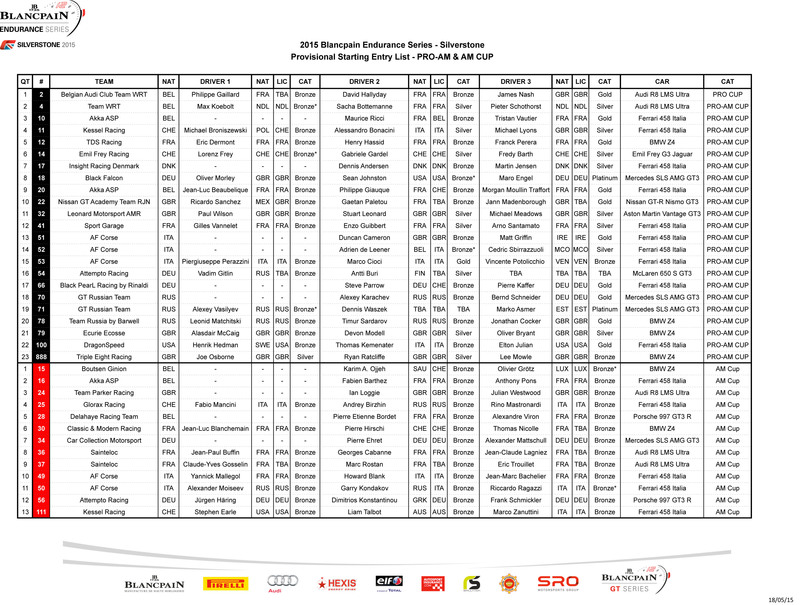 A bumper grid of 61 entries are set for this weekend’s Blancpain Endurance Series round at Silverstone. The largest-ever grid outside of the Total 24 Hours of Spa will feature top efforts from Bentley, McLaren and Aston Martin, all racing on home soil, while up against the likes of Lamborghini and Ferrari, which shined in last month’s opening round at Monza. There are a number of new and revised lineups for Silverstone, particularly in the Pro Cup, which features an impressive 25-car entry. BMW Sports Trophy Team Schubert, fresh off last weekend’s Nurburgring 24, makes its series return with a BMW Z4 GT3 for Dominik Baumann and Max Sandritter. In the Audi camp, Phoenix Racing will utilize the previous-generation Audi R8 LMS ultra, following the new R8 LMS’s debut in Monza. 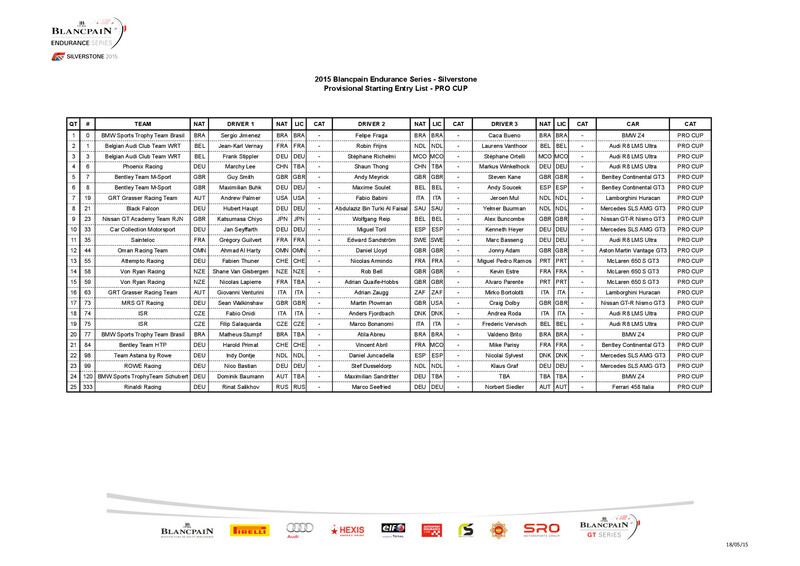 The German squad’s lone entry sees a reworked driver lineup of Marchy Lee, Shaun Tong and Markus Winkelhock. Marc Basseng replaces Edoardo Mortara at the wheel of the No. 35 Sainteloc Audi, while Nicolas Lapierre has been drafted into the No. 58 Von Ryan McLaren 650S GT3, taking Bruno Senna’s seat. Matheus Stumpf returns to BMW Sports Trophy Team Brasil, having been a regular competitor in the team’s BMW Z4 GT3 last year. Rinaldi Racing’s Ferrari 458 Italia GT3 will run in the Pro Cup with the return of Marco Seefried to the lineup, while Car Collection Motorsport also moves up to the top class with its Mercedes-Benz SLS AMG GT3. Belgian Audi Club Team WRT, which is coming off N24 overall victory, has fielded an additional Audi R8 LMS ultra in the Pro-Am Cup for David Hallyday, James Nash and Phillippe Gaillard. Jann Mardenborough, meanwhile, is expected to team with Gaëtan Paletou and Ricardo Sanchez in the No. 22 Nissan GT Academy Team RJN Nissan GT-R NISMO GT3, also in Pro-Am Cup. There are no major changes in the Am Cup, although Christian Kelders has replaced Thomas Nicolle at Classic & Modern Racing due to Nicolle’s commitments in a historic rally round. Claude-Yves Gosselin and Marc Rostan, meanwhile, will team with Eric Trouillet in the No. 37 Sainteloc Audi, one of two R8 LMS ultras entered by the French team in the class. Of note, the hearing on GRT Grasser Racing Team’s appeal following its exclusion from the Monza round is expected to be heard on Wednesday, which should finalize the results from the Italian race. Track action at Silverstone gets underway on Saturday, with Free Practice and Pre-Qualifying, with Qualifying on tap Sunday morning, prior to the start of the three-hour race at 2:45 p.m. local time.